Firstly, please confirm your phone supports wireless charging and built-in receiver coil. Secondly, Please make sure it has connected with the power, you can see the LED indicator light, which indicates the standby status (green) and charging status (blue). Please adjust the position of your cell phones. Please press the bottom button on the back to release the bottom support. [Wireless Fast Charger] Charge your wireless fast charge compatible devices up to 1.5 times faster than standard wireless charging pads, reducing total charging time by up to 50 minutes! Capable of fully charging your Galaxy S9+ / S9 / Note8 / S8+ / S8 / S7 edge / S7 / Note5 / S6 edge+ in about 2.5 hours. Fully charge your Galaxy S8+ in about 3 hours. 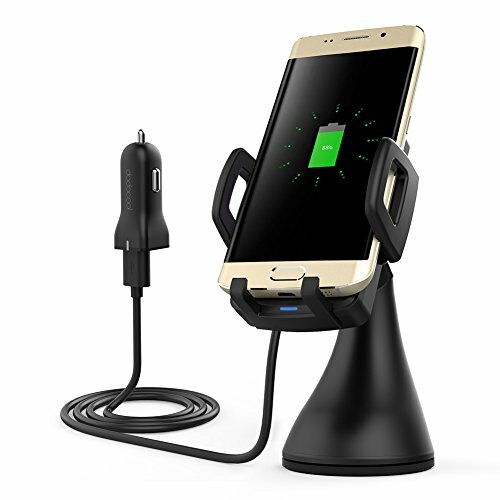 [Two Wireless Charging Modes] (1) Fast wireless charging (Output 10W Max) for Samsung Galaxy S9+ / S9 / Note 8 / S8 / S8+ / S7 edge / S7 / Note5 / S6 edge+, (2) Standard wireless charging (Output 5W Max) for standard Qi-enabled devices, such as for iPhone X / iPhone 8 Plus / iPhone 8 and for Samsung Galaxy S6 edge / S6. [Two Installation Options] Come with an air vent mount and a suction mount.The 360° rotating ball joint on both mounts enables flexible viewing angles while driving. Make for better viewing of your phone. [LED indicator light] Smartly designed LED indicator light on the car charger clearly indicates the standby status (green) and charging status (blue). [Note:] For optimal performance, take off your protective cover and place your device in the proper location on the wireless charger.